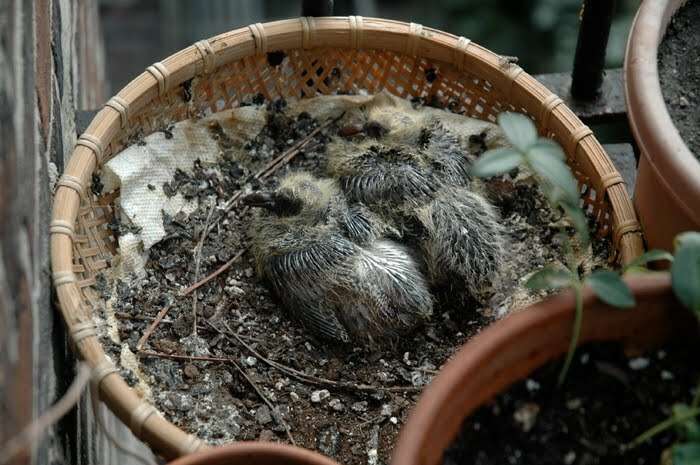 It's official - baby pigeons really are the ugliest things imaginable. If you every wondered what an avian dinosaur looked like, baby pigeons fit the bill. 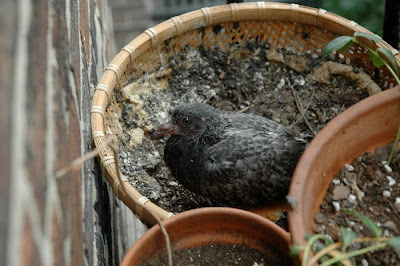 On July 1st, two eggs appeared in a flower pot on my fire escape, right outside the kitchen window. I transferred them to a basket which I placed next to the flower pot - an arrangement acceptable to the mother - and a few weeks later they hatched out, almost unrecognizable as birds. I haven't been home much this summer and it has been too hot to hang out in the kitchen, so I have only seen their progress intermittently. One pigeon died at the beginning of August, but the other hung in there squeaking a squawking to be fed every time the parents showed up. We have not fed it a crumb, lest is stay forever. The weather has finally cooled off and I am home from traveling. 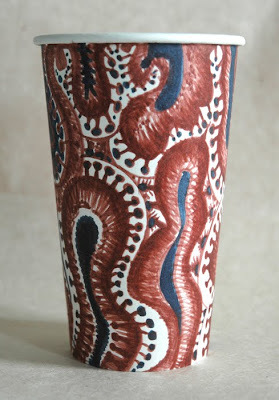 I have been sitting at the kitchen table drinking tea again this week. Empire Coffee and Tea Co. have stopped selling Scottish Blend tea so we are drinking PG Tips until I can get it together to order my favorite blend online or track it down elsewhere in the city. Meanwhile, the pigeon has left the nest and is exploring the flower pots and the windowsill where it sits, unafraid, watching me drink tea. It is not ready to fly yet - not all the feathers are in - but there is much wing stretching and flapping going on, and endless preening of feathers. 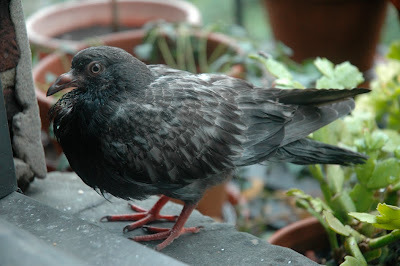 Now pigeon friends show up. Not the parents but other characters I haven't seen before, checking out the adolescent bird. Guess she is a girl, but she just squawks for food endlessly and they fly away. She kind of reminds me of my teenage daughter, but don't let my daughter know I said that. Adolescent bird keeping me company, late August. Shouldn't she be leaving soon? I grabbed a stack of my coffee cup empties yesterday and took the R train down to the very tip of Manhattan. There Paul-André Fortier was set to perform his 30 minute dance called Solo 30 x 30 in front of the office tower, One New York Plaza. The dance takes place firmly within a large area demarcated by white lines and he has been doing it every day for 30 days as part of the River to River Festival. On this the 27th day, the Drawing Center had stepped in to initiate a drawing event. Word had gone out via Facebook that artists should come and draw. So there I was at noon, sitting on the ground just outside the white lines with cups and pens at the ready. 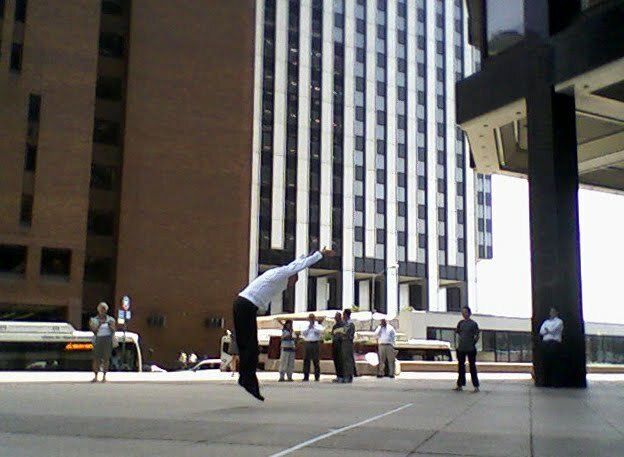 For the next 30 minutes I was mesmerized by the fluidity and grace of his performance as he echoed, embraced and transformed both the movement of people walking to and fro on their lunch hour and the lines of the surrounding architecture. As I drew rapidly, looking up and down from my cups, the crisp black and white of his attire registered strongly, contrasting with the gray plaza surface and a tall brick building behind. 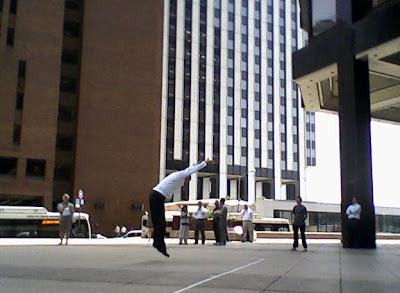 My eye made repeated connections between his form and the similarly clad white-collar workers watching him dance. At 12:30PM precisely Paul-André took his last elegant bow and exited the box. His face glistened with perspiration in the soaring noon heat, but his attire remained unrumpled and unstained, as if ready for an afternoon in an office cubicle. 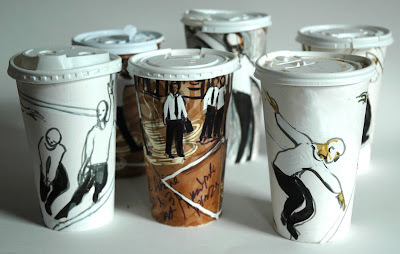 I came to with a lap full of cup drawings, packed up my things and headed for the nearest food cart for a coffee, pleased by the thought that I had sketched his Solo 30 x 30 on cups made by the Solo cup company.